A raccoon sitting on the stump of a tree in the Beaches in Toronto. The Toronto Star's Amy Dempsey thinks there's a particularly smart one in her neighborhood. Toronto has been called the "raccoon capital of the world." The "trash pandas" — as they're (possibly) affectionately known — have been particularly adept at getting into Torontonians' garbage bins. The raccoon scourge was bad enough that the city spent CA$31 million on "raccoon-resistant" organic green-colored waste bins in 2016. It was the latest assault in what Canadian media have called a "raccoon war." The Toronto Star recently published a 6,000-word investigation on the bin battle. "It began in January when I got a message from a friend saying the new green bins have eliminated the raccoon population in Toronto," says reporter Amy Dempsey, who broke the story. "This friend hadn't seen the family of raccoons that had been living in his yard." Dempsey tells NPR's Lulu Garcia-Navarro on Weekend Edition that she reached out to animal behaviorist and raccoon expert Suzanne MacDonald, who had been hearing the same concerns from locals, worried about the possibility that the city's "very fat" raccoons would starve. "She had been measuring and weighing dead raccoons since about a year before the green bin rollout started to see whether their body mass index changed. So I asked if I could go with her and that's where it started," Dempsey says. MacDonald wasn't able to initially say the raccoons were losing weight. But "they're not starving to death, that's for sure," she told Dempsey. The bins, as Dempsey writes, feature "a rotating handle on the lid that connects to a disk on the inside, which, when the lid is shut, fastens into a made-in-Germany gravity lock." You can open the bins by turning the circular latch, or by turning the bins upside-down to 110 degrees, "which triggers the release of the gravity lock." The gravity lock is there to let a robotic arm on garbage trucks open the bins. Raccoons weren't able to open the bins in tests that MacDonald ran — they don't have opposable thumbs. But somehow raccoons kept getting into some people's trash cans, including those of Dempsey and her neighbor. Was it an "uber-raccoon"? "I imagined meetings led by genius raccoons like ours who had successfully broken into green bins and now enjoyed prestige in the raccoon community," she writes. City officials and a representative from the garbage can maker blamed faulty or broken bins for the break-ins. They told Dempsey that latches can become loose over time. The allegedly faulty bin got replaced with a new one. "Then the raccoons got into the second bin and then the city came back and said, 'Well, actually we think there might be something wrong with the second bin that you've had,' " Dempsey tells NPR. Dempsey captured the brazen success on video. Around this time in the story, MacDonald checked back in to say the dead raccoons were coming up just as heavy as before, if not slightly heavier. They still weren't starving. A bin company sales manager said Dempsey's second bin had a faulty handle and was too easy to turn. 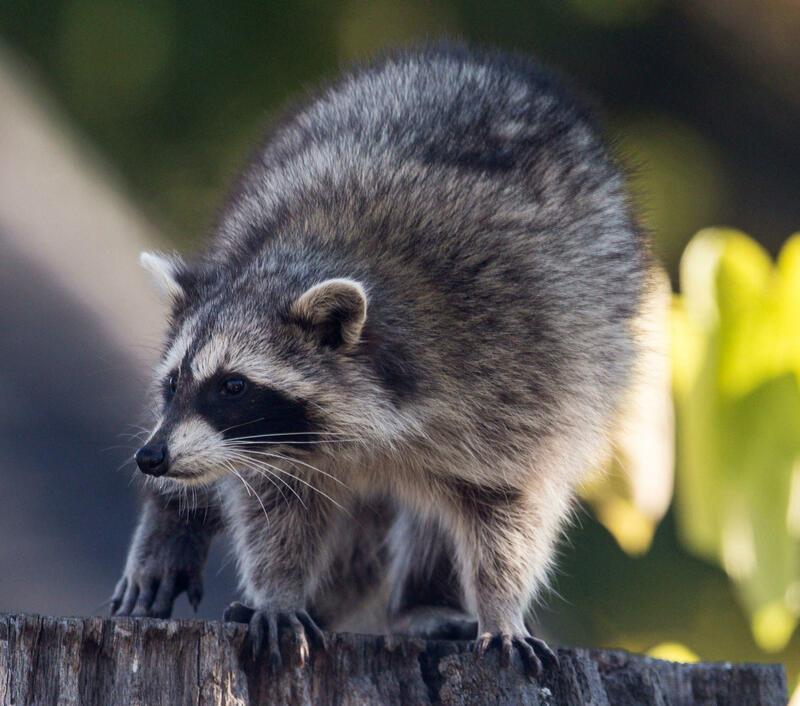 "The city maintains that the bins are working well and the breaches are not a widespread problem, with just 24 raccoon-related complaints out of nearly half a million bins," Dempsey writes. Dempsey doesn't think it's a widespread problem either — just that there happens to be "The Smartest Raccoon in East York" prowling her neighborhood. There might be more. "One of the videos I captured, the raccoon just walks up to the bin, pulls it right down and it lands with a bang and then she turns and looks directly at the camera almost as if to say, 'Huh, you can't stop me. You can't stop me.' "
NPR's Alexis Diao and Ian Stewart produced and edited this story for radio. Toronto has been called the raccoon capital of the world. And if you know anything about trash pandas, as they're not so affectionately known, you know this, they'll do anything to get your leftovers. The Canadian raccoons were so adept at getting into trash cans that a few years back, the city of Toronto spent more than $20 million on new cans that were meant to outsmart the critters. Spoiler alert - things did not go as planned. What happened next is the subject of a 6,000-word investigation by the Toronto Star and staff reporter Amy Dempsey, who joins us now. Welcome. GARCIA-NAVARRO: You write that a simple inquiry turned into an accidental investigation. So where does this story begin? DEMPSEY: It began in January when I got a message from a friend saying the new green bins have eliminated the raccoon population in Toronto. This friend hadn't seen the family of raccoons that had been living in his yard. Friends of his hadn't seen their raccoons. GARCIA-NAVARRO: And the idea is that these raccoon families might have been starving because they couldn't get into the trash cans anymore. DEMPSEY: Yes. And so I reached out to Toronto's foremost raccoon expert, probably the world's foremost raccoon expert, Suzanne MacDonald. I wrote to her saying, are the raccoons starving? She, unbeknownst to me, had been getting a lot of inquiries from people asking the same question. And she had been measuring and weighing dead raccoons since about a year before the green bin rollout started to see whether their body mass index changed. So I asked if I could go with her, and that's where it started. GARCIA-NAVARRO: This got personal for you pretty fast. You launched your own hidden camera investigation. DEMPSEY: I did. I mean, one week I went outside and found that my neighbor's green bin had been toppled over and was open. So I texted her and said, you know, your green bin has been breached. And I sort of blamed it on her a little bit. I said, you must have left it unlocked because the raccoons - they can't get into these things. And then they started getting into mine. And it became very clear that they were opening them somehow. These bins, when you tip them to 110 degrees, open automatically. So Suzanne MacDonald, the raccoon expert, loaned me a trail camera, and I began performing surveillance in my laneway. DEMPSEY: The truth was there is at least one raccoon in my neighborhood who can open the green bins. Now, the city said, you know, your bin might be loose. Allow us to replace your bin. So it was replaced. And then the raccoons got into the second bin and then the city came back and said, well actually, we think there might be something wrong with the second bin that you've had. It's pretty clear that some of the raccoons can get in. And they simply knock them over and turn the handle just as we do. GARCIA-NAVARRO: Yeah. So what is your takeaway? Are raccoons sort of smarter than humans? Are we making a super raccoon that will take over Toronto at some point? DEMPSEY: They're definitely not smarter than us. Some of them are really dumb. Like, I definitely have footage of raccoons who just crawl all over it for a little while and then slink away. But some of them - it is amazing how smart they seem to be. One of the videos I captured, the raccoon just walks up to the bin, pulls it right down and it lands with a bang. And then she turns and looks directly at the camera, almost as if to say, ha, you can't stop me. You can't stop me. GARCIA-NAVARRO: (Laughter). Amy Dempsey, an investigative reporter at the Toronto Star on the raccoon beat. Thank you so much. GARCIA-NAVARRO: And FYI, raccoon expert Suzanne MacDonald, told the Toronto Star that her research is ongoing, but the raccoons are, quote, "not starving to death - that's for sure." Transcript provided by NPR, Copyright NPR.